Don’t you – and every member of your family – hope to keep your teeth for life? That’s exactly what we want for you too. It is why all of our care is focused on prevention first and foremost. We also know that when you and your family actually enjoy seeing us, you are much more likely to keep up with your preventive care and as a result, you’re also more likely to have the optimal oral health you need to fully enjoy life. Routine hygiene appointments help to prevent major dental issues. Call today to schedule an appointment at Jackson Dental. We take your check-ups very seriously. Why? They are our best opportunity to discover problems before they develop. That’s what preventive dentistry is all about, right? During these exams we look at both the outside and inside of your mouth, looking for problems with your bite, documenting how your teeth fit together, measuring your gum pockets and checking for infection, examining each tooth for signs of wear or decay, and making absolutely sure that everything looks strong and healthy and is developing the way it should. We involve everyone in their care, showing you exactly what is going on. Kids especially appreciate this and love to get involved in their dental exams, checking out x-rays and intraoral camera stills, talking about their hygiene habits, and learning all about how they can take good care of their smiles. We make every comprehensive dental exam an unforgettable learning experience. It is surprising how many cases of oral cancer are diagnosed each year, and we don’t want you to be one of those statistics. We make sure to check every member of your family for the first signs of mouth cancer every time you are with us. Our dentists and hygienists are specially trained to recognize even the tiniest, most subtle signs, so we can get you treated and back to health as quickly as possible. Our x-rays are yet another example of how much we love our patients. Not only do we use only digital x-rays for lower radiation and clearer images, we also use panoramic x-rays. They provide a full view of your head and neck, which is especially useful when evaluating patients for orthodontic treatment, and checking for TMD-related bite issues. 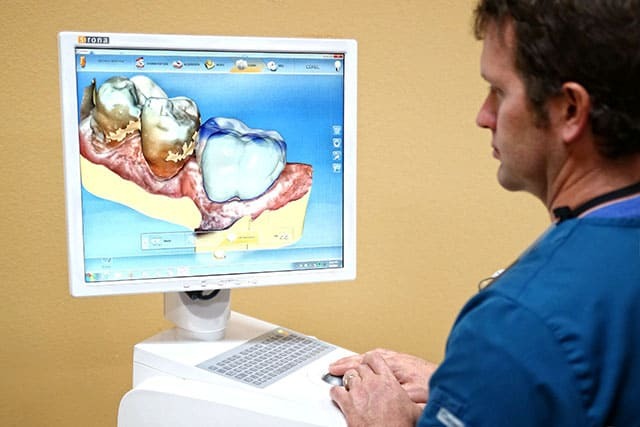 Our 3D cone beam imaging allows us to get 3-dimensional images of your entire oral and maxillofacial structures – in about a minute. It is the perfect guide for things like precision implant placement! 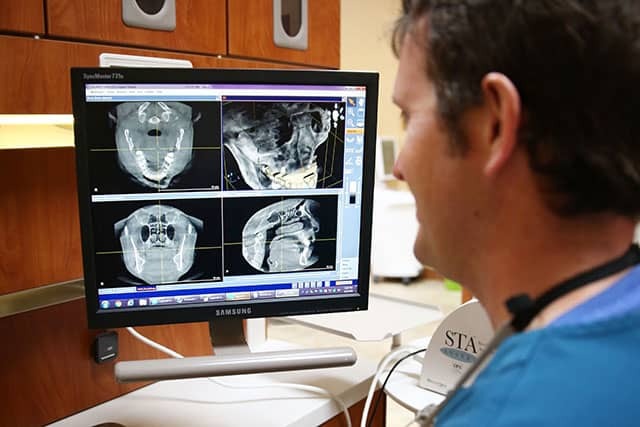 In addition to x-rays, we also use the DIAGNOdent diagnostic laser to detect decay before it can be seen on x-rays and before we can see it with the naked eye. This allows us to treat cavities far more conservatively than ever before. No matter how well you brush your teeth, home care is just not enough to keep your teeth and gums free of tartar buildup and stains. While stains may not affect your health, tartar will because it is essentially made up of bacteria! Keeping your teeth and gums as free as possible of this bacteria will keep both your body and your smile healthier. Of course, we always take plenty of time while gently removing all tartar and plaque buildup on your teeth and around your gums to polish away stains. We use both the cavitron and piezo ultrasonic cleaning devices for a comfortable, customized clean you can count on. You’ll leave with a smile that feels great and looks great too! You notice a little bleeding when you floss. Your gums feel puffy. Maybe your teeth feel a little extra sensitive or loose. Then again, you might not have any noticeable symptoms at all! It’s gum disease, and it can strike anyone, anytime. Keeping up with your regular hygiene visits is an excellent way to prevent it, but once in awhile, periodontal infection creeps up on you and puts your mouth – and your body at risk. That’s when our periodontal therapy comes to the rescue. We can bring your smile back to health using laser therapy both to clean and disinfect your teeth and your gum sockets. Our soft tissue management program has helped hundreds of patients regain their health and protect their bodies from the damaging effects of gum disease. We also use OralDNA testing to discover your risk for gum disease. We rely on the LANAP™ soft tissue laser for efficient, effective treatment and socket disinfection that doesn’t use sutures or cutting associated with traditional periodontal therapy. The LANAP soft tissue laser is the only FDA approved soft tissue laser for certified dentists. Don’t wait until your gums bleed to ask about the dangers of periodontal disease. Call us today and let us help you stay healthy and strong. Life is hard on teeth. Everything you eat, drink, or chew can have a dramatic effect on your enamel. Our fluoride treatments can protect your teeth and even remineralize them! We recommend that kids under 14 have at least two fluoride treatments a year. We also recommend that adults who are at a high risk for tooth decay talk to us about receiving fluoride treatments that are customized to their individual needs. And if you need even more fluoride protection, we also offer recommendations on how to use fluoride at home. Every active kid needs a mouthguard to protect their precious smiles from damage during sports, and even limit their risk for concussions. But did you know that adults can benefit from mouthguards too? We offer Under Armour adult sports mouthguards and nighttime bruxism guards to protect your teeth both day and night. Under Armour sports mouthguards relieve pressure and keep you from clenching so your body can unleash its full potential. As a result, when you wear one of our mouthguards, you really are better, faster, and stronger. Our bruxism dental guards protect teeth from the stress you put on them during sleep. These are especially useful for anyone who knows they grind or clench their teeth at night and can save both teeth and valuable restorations from nighttime wear and tear. Do you get the jitters just thinking about calling the dentist? We understand. And while we go out of our way to wrap you in comfort and treat you with gentle consideration, sometimes you need just a little extra support to calm your nerves. We offer nitrous oxide anesthesia to soothe and calm both adults and children. Our wand anesthetic delivery system makes novocaine shots virtually painless. And if you still need a little something to get you as comfortable as possible, talk to us about oral sedation to take the edge off. If you choose this option you will need someone to drive you to and from your appointment. Because we always use a complete dentistry approach, keeping an eye on your entire wellbeing, we analyze everything from your teeth to the way you breathe. If we notice any indicators of sleep apnea, or if it is part of your medical history, we will talk to you about the possibility that you might be suffering from sleep apnea. Don’t be surprised! We start with a CT scan to take a look at your anatomy and see if anything points to an apnea problem. We also send you home with a sleep monitor so we can check out what your sleep patterns are like. While we can’t diagnose sleep apnea in dentistry, we will work closely with your own MD or one we recommend to get you the recommended full sleep study, if needed. If you are diagnosed with sleep apnea, and you don’t want to wear a CPAP, we can help with that too. Our oral appliances are compact, comfortable, and work like a charm for mild to moderate sleep apnea. Yikes! It’s a dental emergency! No one likes them, but we can certainly make them a lot more tolerable. Call us right away and we will either get you in as soon as possible during the day, or talk to you and evaluate your needs after hours. And if the emergency involves a tooth being knocked out, take care of it! Don’t scrub or wash it. Just gently rinse it under cool water, and put it under your tongue or in a glass of milk. Then get to us just as soon as you can! We’ll be waiting. We think of our technology as a mechanical version of our love. Advanced technology lets us make everything so much faster, easier, more comfortable, and ever-so-convenient. ● Computerized treatment rooms make keeping records up-to-date and easily accessible. ● LANAP Soft tissue laser allows us to treat a variety of conditions such as cold sores and lesions quickly and painlessly. This laser also allow us to complete frenectomies without the need for stitches. It all adds up to better care and more comfort for the whole family. We don’t think you should live with chronic pain! Talk to us about the possibility that you are suffering from TMJ disorder. Visit our TMJ Treatment page to learn more.